UNO Captain Mason Morelli braces for impact as he enters a fight for the puck against Arizona State. Photo courtesy Maria Nevada. 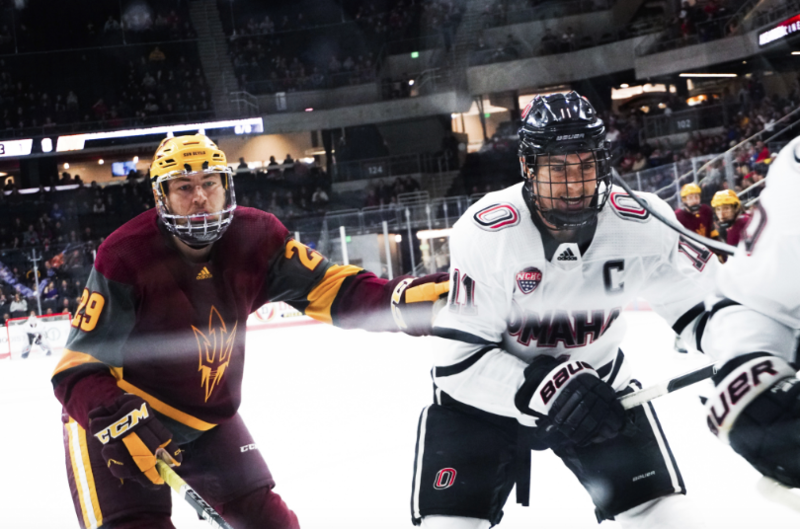 After two straight conference matchups and a 13-day break, UNO hockey took the ice against the Arizona State (ASU) Sun Devils Friday and Saturday night (Nov. 23 and 24) at Baxter Arena. The Mavericks entered the two-game home series against a dangerous ASU team with an unimpressive 2-7-1 record on the season and were swept by the Sun Devils on the road earlier this year. Fortunately, this rematch took place here in Omaha–and the results were much different. ASU scored the first goal Friday night and took a very early 1-0 lead off the stick of Brett Gruber only 55 seconds into the first period. UNO was quick to answer when Travis Kothenbeutel scored about 40 seconds later to tie it all up. Fans were in for a fun game as three of the 10 total goals came in the first period, the last one being from UNO’s Mason Morelli during a power play to give the Mavs a 2-1 lead with 1:17 remaining in the first period. Brinson Pasichnuk of ASU scored an equalizer about six and a half minutes into the second period to bring the Sun Devils back into the game 2-2. UNO’s Fredrik Olofsson brought UNO back out on top, but not long before Arizona State’s Austin Lemieux managed a goal past Evan Weninger to make it 3-3 entering the third period. Arizona State took a 4-3 lead with about eight minutes remaining in the game before UNO decided to pour it on. Goals from the likes of Taylor Ward, Olofsson and Steven Spinner vaulted Omaha to a 6-4 victory in game one. Game two had a much different feel to it as UNO controlled the pace for nearly the entire game. UNO’s goalie, Weninger, played lights out for the Mavericks as they managed to shut out their opponent for the first time this season. A UNO power play opened the scoring on Saturday night as Morelli scored his first goal of the night just five minutes into the first period. The Mavs made it 2-0 on a short-handed goal from Riley Alferd during the second period and continued to maintain control of the game when Olofsson scored again to make it 3-0 entering the third period. Outstanding defense allowed Morelli to score Omaha’s fourth, and his second, goal of the night to cap off a sweep of ASU with a 4-0 win. The Mavs are now 4-7-1 on the year and will move back into conference play next weekend at Baxter Arena against a tough Colorado College team.